This was a weekend where our only truly live performance — that is, a performance were (if we wanted to, and security allowed, we could touch the performers) — was Saturday for the Klezmatics. 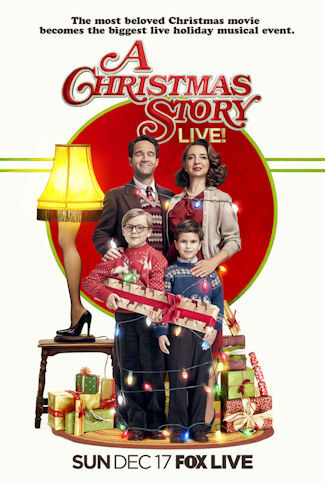 But we did see another performance that was labeled “Live!” (but was tape delayed for our timezone): A Christmas Story Live! on Fox (KTTV 11) Sunday night. This is part of the trend of bringing back “live” musicals on television that was restarted with A Sound of Music on NBC, and has continued there with Peter Pan, The Wiz, Hairspray Live!, and which Fox picked up to bring us Grease Live!. NBC didn’t have a holiday musical this year (Bye Bye Birdie, which was planned for this month, but indefinitely postponed), but Fox brought us their incarnation of A Christmas Story – The Musical (which, I should note, that if you want to see really live you can at the Canyon Theatre Guild (FB), or numerous other venues around this country). Don’t worry, there are even more “live theatricals” (Jesus Christ Superstar, Rent) in the pipelines. NBC’s attempts have attempted to preserve the form have kept that “stage” feel: static sets, no special television tricks or techniques. Fox, on the other hand, has gone for this odd hybrid between stage and screen: expansive sets designed to keep the steadicam operator busy, some elements of realism in the set design and execution, significantly larger ensembles, and often camera and cinematography tricks. The “risk” of live performance is still there, however, as they still have to navigate set movement, costume changes, and the cinematography tricks in real time. I’m not 100% sure I like Fox’s approach, but I understand why they did it. Benj Pasek and Justin Paul (FB) appear to have written two new songs for this show: the opening number which was “eh?”, and a number on Chanukah. That number, while good, felt shoehorned in for inclusivity, especially with the overkill of the Magen David-themed wall paper and getting the number of nights right. Two problems, however. The song sang of Matzah Balls, which most assuredly are not Chanukah food; and the Jewish family was later in line for Santa (highly unlikely, even in the 40s). Inclusivity was a big theme in this, especially with the mixed nature of the ensemble. Now I’m all for inclusivity and diversity, but in this production it felt too politically correct, too forced, too … wrong. Perhaps that was because they were going for the realism aspect, and it didn’t fit the real world of the 1940s. On stage, you can get away with the diversity because the realism isn’t there. Matthew Broderick did pretty good, but there seemed to be a few points where he had line hesitations. For such a seasoned stage actor, that seemed wrong. There appeared to be only one line gaffe, when the father (Chris Diamantopoulos) was stealing a taste of the turkey and cracked up the mother. They covered it well. Having now seen the story, it seems a bit inconsequential and forced to be a musical; but I can also see why it, just like Elf – The Musical created around the same time, will be perennial holiday favorites at small companies throughout the world. Why they can’t just do A Mulholland Christmas Carol is beyond me. The actor playing Ralphie (Andy Walken (FB)) did a great job — he handled the music and the cuteness well, although he was a bit fast talking on the commercial breaks. … and they’re dancing on snow, too! One of the kids in the kids ensemble (Artyon Celeste) looked like Gary Coleman, and got me thinking of a remake of Different Strokes (although that wouldn’t work these days — these days the diversity comedy is Superior Donuts). Overall, the kids ensemble was very strong in the show. For all their attempts to be “period” — from the Cars to the Kelvinator — there were some significant slipups, such as the electrically lighted hand-held candles in one song to the lighted candy canes in the other. The directors (Scott Ellis and Alex Rudzinski) really must decide if they are going for realism or not. During the “Ralphie to the Rescue”, the use of TV tricks (black and white, graininess) was gratuitous and unnecessary, especially as this was supposedly a live production of a stage show, not a movie. The odd breaks into production numbers were odd given the realistic nature of this — they need to pick one form or the other. Such production numbers are something that will work much much better on stage, and do make me want to see the stage version of this in the future. Viewers slammed this remake. The ratings were worse than any of the recent live musicals broadcast to date. We may be going to the 58th Annual L.A. County Holiday Celebration, as they are featuring Klezmer Music from 3-6pm on Dec 24, and we can take advantage of Metro to avoid the traffic. Of course there will also be the obligatory Christmas Day movie — who knows — perhaps it’ll be the upcoming The Greatest Showman. Afterward: The obligatory Chinese Food. March was supposed to start with the MRJ Man of the Year dinner, but that shifted back a week, so we’ll go to it after our first show in March, the LA Premiere of the musical Allegiance at the Japanese American Cultural and Community Center (FB). This is followed by a HOLD for Steel Pier at the UCLA School of Television, Film, and Theatre (FB). The penultimate Friday of March brings Billy Porter singing Richard Rodgers at the Saroya (the venue formerly known as the Valley Performing Arts Center (VPAC)) (FB). The last weekend of March is open for theatre, but there will be the Men of TAS Seder. Currently, we’re booking all the way out in mid to late 2018! We may also be adding a CTG subscription, given their recent announcements regarding the next season.